October mostly has been warm and sunny here, but last night a thunderstorm blew in and cooled things off. This morning it looked much more typical of this time of year—cool, damp, and cloudy. When I stepped outside, though, I noticed some new color in the front garden to balance the dark sky. 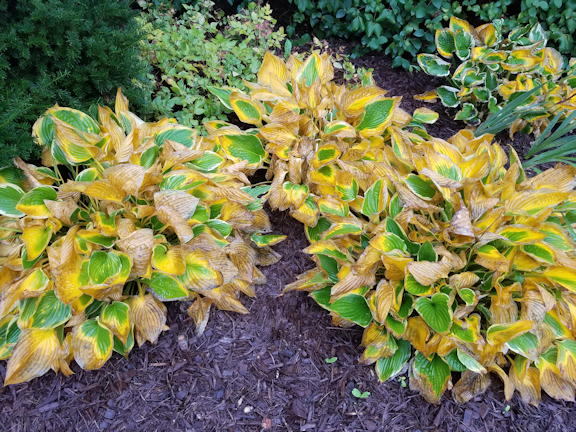 Solid green hosta leaves had turned—overnight, it seemed—to a bright, cheerful mix of yellow, green, and brown. Don’t they look as if they just put on their party dresses and are ready for dancing and fun? Ohhhh, so lovely! A new day gift for you to enjoy — and to share with us. Thank you!! They are very beautiful! Nature’s nurturing gift! Pretty and colorful. Delighted to see this !!! You said right, a party dress, yes this time of the year Earth is having a party, so many beautiful colours around.